Well, you'll all be relieved to hear that the pineapple upside-down cake tasted as good as it looked. Especially good with a glass of dark rum. Last night, I dreamt I was out drinking with Barack Obama. He was really fun. Barack said we should get some french fries and I said we didn't have time because we had to meet some people on the other side of town, but Barack said not to worry. Sure enough, they brought the fries right out because Barack was friends with the bartender. 1. Preheat the oven to 400°. Spray a 9-inch round cake pan with unflavored cooking spray. Melt 1 stick of the butter and set aside. 2. In a small saucepan, melt the remaining 4 tablespoons of butter with the brown sugar over medium heat, about 3 minutes. Spread the butter-and-sugar mixture in the bottom of the prepared cake pan. 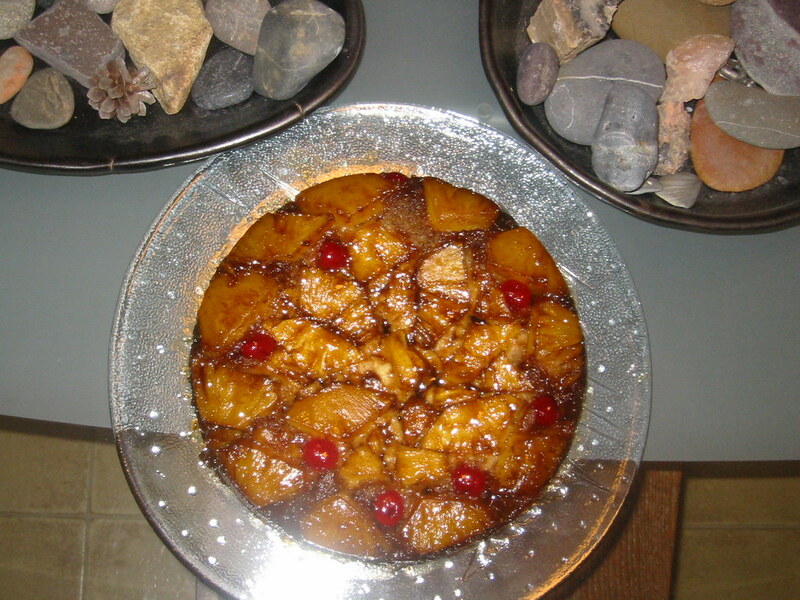 Distribute the pineapple slices evenly over the mixture and set the pan aside. 3. In a large bowl, combine the flour, baking powder, sugar and salt. In a medium bowl, beat together the egg, milk and the reserved melted butter. Stir the liquid ingredients into the dry ingredients until well combined; the batter will be thick. Using a rubber spatula, scoop the batter into the cake pan, spreading it until it reaches the sides of the pan. 4. Bake the cake until the top is golden brown and a toothpick inserted in the center comes out clean, about 30 to 35 minutes. 5. Let the cake cool for 15 minutes. Place a serving plate over the cake pan and invert. Slowly lift off the pan and serve. Right on! I also threw a dash or two of cardamom into the cake batter for a bit of zest. glad to hear the cake was a success. Barack said we should get some french fries and I said we didn't have time because we had to meet some people on the other side of town, but Barack said not to worry. Sure enough, they brought the fries right out because Barack was friends with the bartender. now THAT's executive privilege. on demand french fries anywhere in the world. i had a dream the other night i was in a minimart with my best friend, and sean penn was ahead of us in line, and really drunk. my friend and i were picking on him, but we didn't think he heard us. then he turns around and looks at me and says "you guys need to be more CASTILIAN," and i'm like "what?" and he repeats himself. "spanish? ", i say, and he responds "no no - SUBTLE, you know, subtle...castilian." Sean Penn knows the secret, occult meanings of everyday words. oh wow. definitely one for the end of year contest. That should have been in his campaign somewhere, promises of immediate french fries. I also respect that dream Barack didn't call them freedom fries. Oh man, that totally sounds like Barack. This is what you can look forward to, America! Four years of snappy service thanks to inside connections!